What a strange, but strangely good movie. That’s probably what you’ll think if you get a chance to see Tale of Tales, a genre blending movie with an all-star cast. 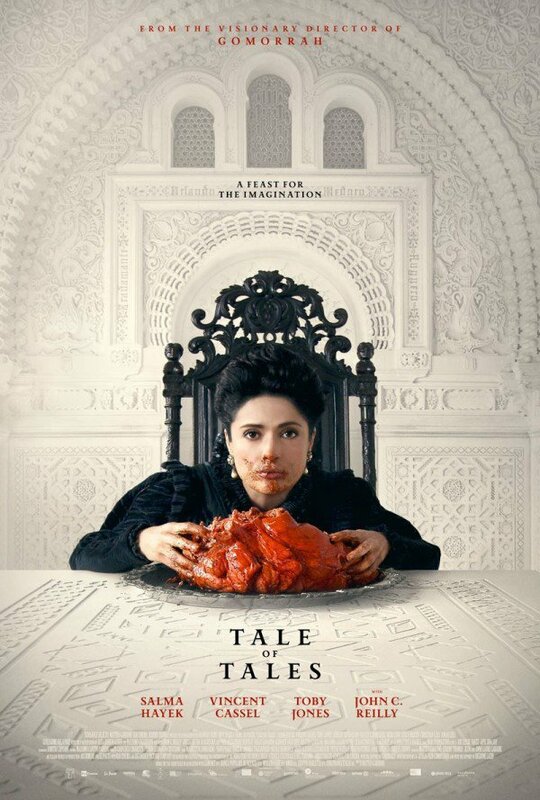 Tale of Tales is presented as three fables woven together through common themes of female desire and the ironic consequences of those desires. In the first, Salma Hayek plays a queen unable to bear a child. Crushed, she turns to a court mystic who tells her that the only way to become pregnant is for her husband, the king (John C. Reilly) to slay a giant sea beast and devour its still-beating heart. Next up is Toby Jones as a slightly daffy monarch who raises a tiny flea as a pet, feeding it his own blood until it grows into the size of a hippo. Meanwhile, his beautiful daughter yearns to be wed and finds herself paired off with a ghastly ogre. In the last, Vincent Cassel plays yet another royal whose unquenchable libido leads him to fall in love (or, at least in lust) with a wrinkled crone whose singing voice enchants him. This is an utterly charming movie with some decent talent holding it together. It has a near whimsical air, despite the fact that its subject matter is decidedly adult. It’s almost the stuff of folklore, and in a way, made me thing of Arabian Nights, which is one of my favorites. I will say that’s one thing it was missing was the cohesive feel that Arabian Nights had. Despite the fact that the stories had nothing to do with each other, they all tied together. They didn’t do that with these vignettes and as a result, lost something. Sure, they all paired together a broken king with an overbearing woman, but for the most part, they didn’t feel cohesive. Some of the scenes go a bit too far with the ‘be careful what you wish for’ and I wish they’d tried to go with a more unique direction in the underlying theme. But overall, I’d call this movie a fair B effort. They went a long way two create a classic, yet colorful set and it looks like what it’s supposed to be; a twisted fairy tale. One thing I didn’t like was the intro to each tale starting with a funeral. Again, this was an attempt at cohesiveness that really didn’t tie the stories together, so much as they made them force in the intro in often clunky ways. That was a clumsy effort. Once the stories get going, the magic happens, though not in equal levels. The problem is that at each peak, we’re switched back to a new story, making us forget what’s going on in one vignette and get drawn in to another. But for the most part, it’s still an enjoyable movie with a compelling cast. Of course, this is not for kids, as there’s more than a few lewd and outright upsetting moments. But for adults, it has a quirky charm that you’re not going to find in standard movie fare.